With Samsung expected to unveil the successor to the Gear S3 smartwatch at IFA in late August/early September, it seems that its South Korean neighbor LG is also about to make some noise again in the wearables market. According to a fresh report published today, LG could introduce a pair of new timepieces as soon as this month. Both watches will run on Google's Wear OS platform. 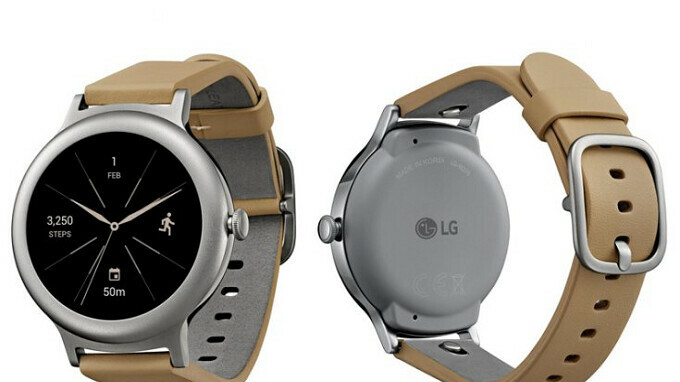 Two different LG smartwatches appeared at the FCC in May and June. The model numbers were LM-W315 and LM-W319, respectively. The W315 is believed to feature a 1.2 inch carousel display, powered by the Snapdragon 2100 wearable chipset. 768MB of RAM is said to be inside, along with 4GB of internal storage. The device will supposedly have an IP68 certification rating, allowing the device to emerge unscathed from a dunking in up to nearly 5-feet of water, for as long as 30-minutes. A separate report from earlier this year claimed that LG will have one new Sport smartwatch, and one new Style Smartwatch. Neither will offer cellular connectivity, GPS or NFC. The new watches will reportedly be available in Aurora Black and Cloud Silver, priced in the $300-$400 ballpark. Overpriced. I would rather spend $400 the Gear S3 or even an Apple Watch 4th gen.